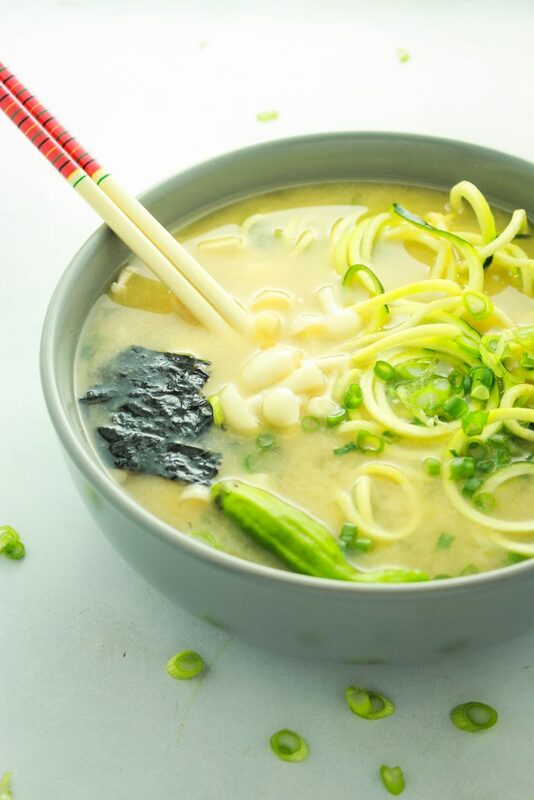 This soul-warming miso soup recipe uses simple ingredients and comes together in under 20 minutes. It’s better than takeout! It was 70 degrees yesterday. It’s snowing today. Therefore, it’s obviously still soup season. And I have no excuse to not sit down and get this recipe online. 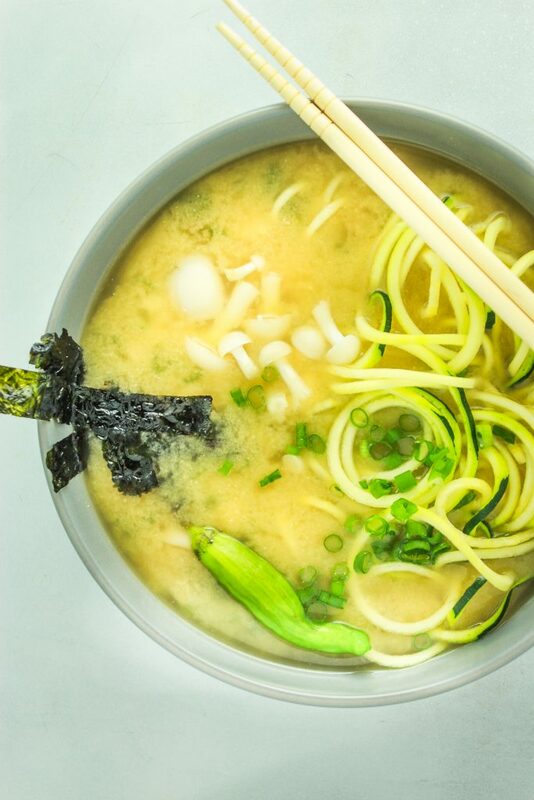 You guys NEED this miso soup recipe today! Also – if I do this now, I can postpone working out for another hour.  Priorities, y’all. My last few posts have been short. And that’s because things have been busy for us lately. Whenever life gets busy, writing always seems to fall by the wayside. Which should NOT be the case. Still working on that resolution.  We went back to Indiana for a stint to work at the bowling center during its busy season. Along the way we stopped in Oklahoma to visit my best friend, her hubby, and their new baby. Then the holidays rolled around. 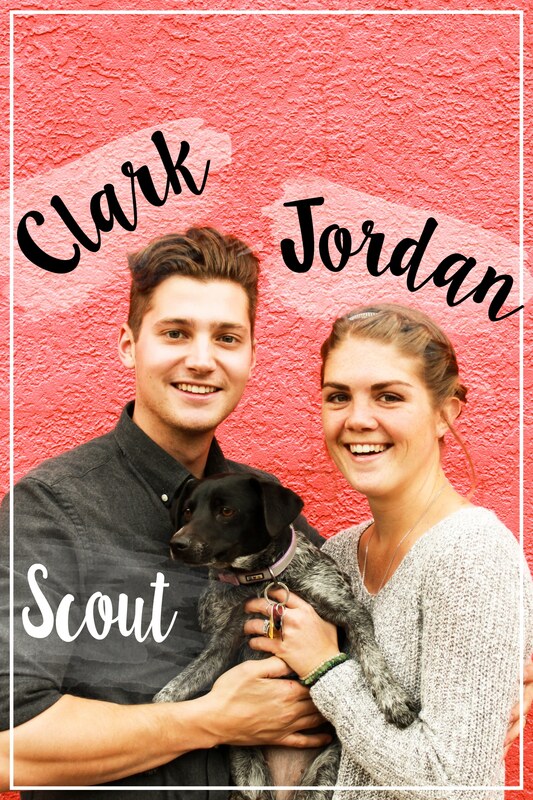 We got to spend precious time with family – Clark’s brother was in town, too! Then it was New Year’s Eve and the next day my brother left for Malaysia (not fun). Then we had 3 weekends of private parties to host (FUN!) and 2 new leagues to get started (also FUN!). After we finally rolled out for Colorado last Wednesday, we stopped halfway in Overland Park to stay with my grandma’s sister. Her son, daughter, and son-in-law were all there, too. We had an absolutely awesome time visiting with them. For as long as I can remember, they’ve always lived far away – I never got to know them very well. And Clark had never even met them before but it was like spending time with old friends. Such, such cool people. It’s so rare to meet people that can carry on a meaningful conversation. No cell phones. No TV. No politics. Just real life stuff. The night went by too quickly and we had to leave the next morning, but I would’ve been happy to stay longer. If you read this far, bless you. Enough about us, though! Let’s talk about food. 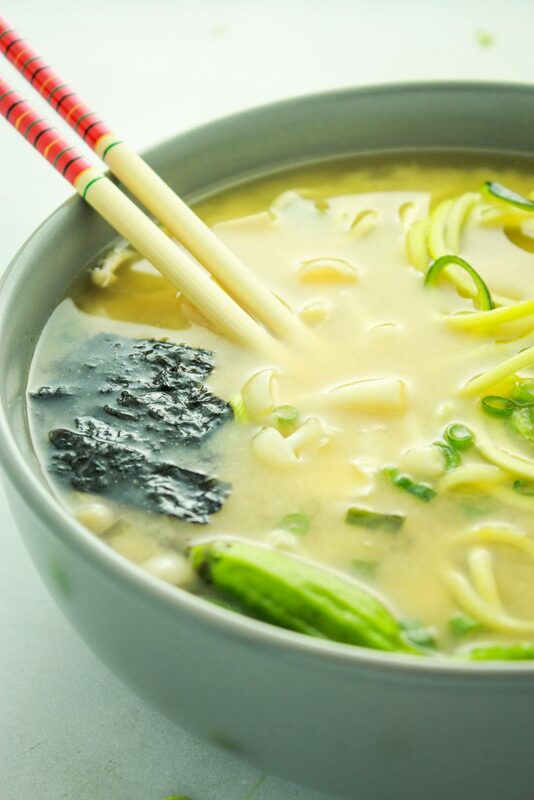 In particular, this BOMB.COM miso soup. 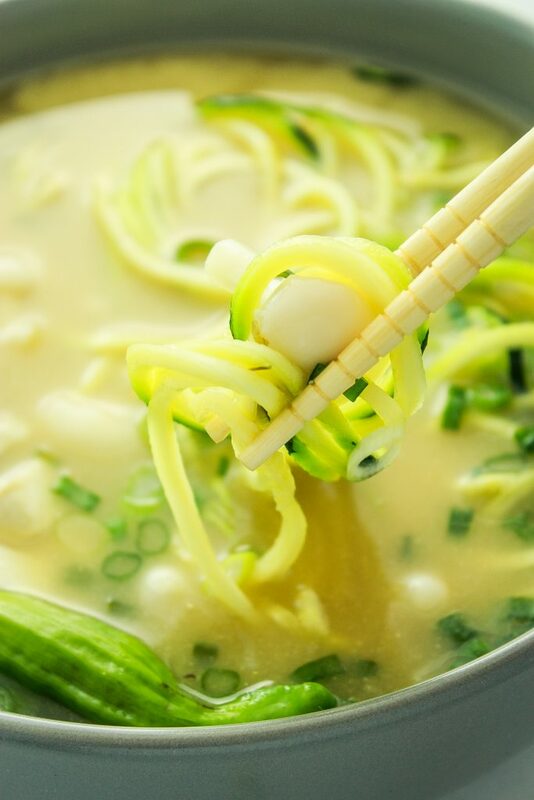 Whenever we go out for sushi or Japanese food, I always order miso soup. Sometimes it’s good, sometimes it’s meh. At some point, we realized that we could make it at home AND make it better. Game-changer. All you need is a few simple ingredients to recreate this recipe at home. If you don’t have miso paste on hand (I know it’s not a super common ingredient), you can usually find it at your local supermarket. If not, check Whole Foods or an Asian market if you have one nearby. One tub will last a long time and make plenty of batches of soup. Plus, you can use it to make the dressing for these sweet potato and quinoa bowls! 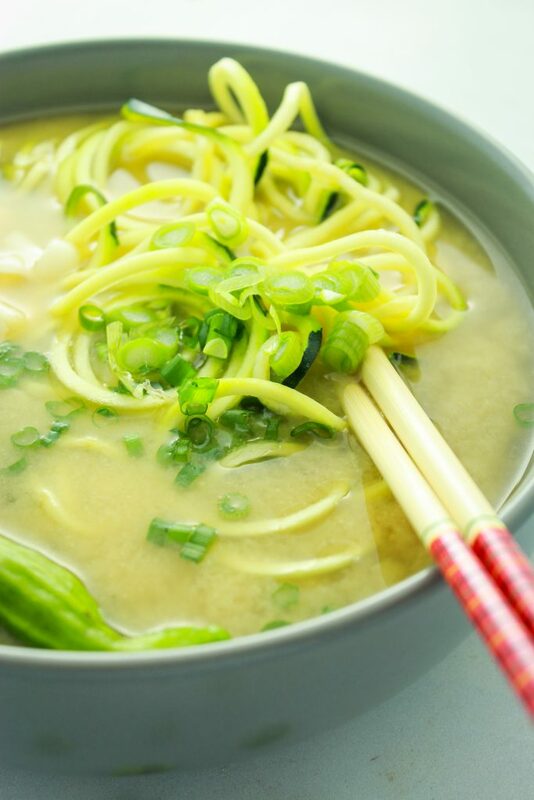 This vegan miso soup recipe uses simple ingredients and comes together in under 20 minutes. It’s better than takeout! Drain tofu and press to remove excess water. (Sandwich it between a few paper towels and squeeze.) Chop into 1/2″ cubes and set aside. 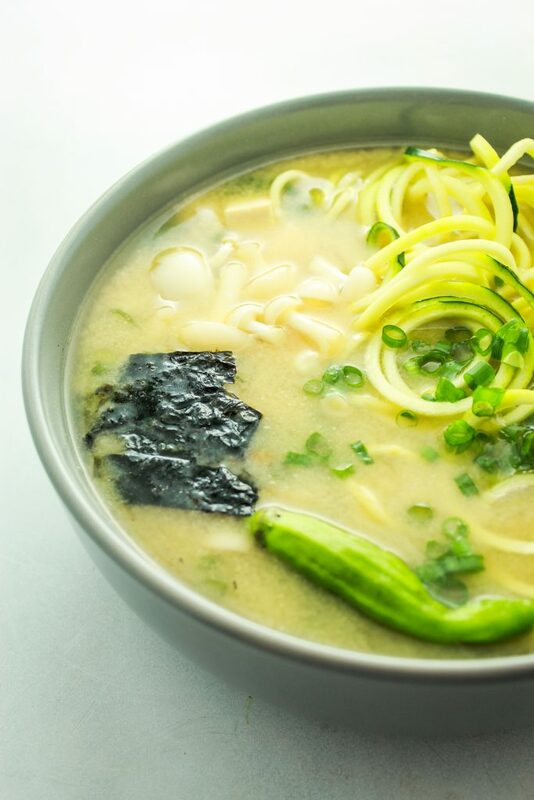 In a small bowl, mix together miso paste and hot water until the paste is smooth and consistent. In a medium pot, bring 3 cups of water and 1 cup of broth to a boil. Decrease heat to simmer and add miso paste to the pot. Cook 2 minutes. Add tofu, mushrooms, and green onion. Cook on low 5 minutes. *We used seaweed snacks instead of nori. They’re $1 per package and we always have some on hand. Also available at any average supermarket! 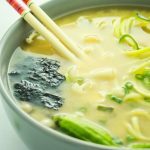 I just got some miso from our local japanese grocery store, and was looking for a good recipe. I’m definitely going to try this one, thanks! Yay! Be sure to let me know what you think!